"We're gunna find this guy." A trailer has arrived for a new crime thriller titled Hangman, which is about detectives hunting a serial killer, but apparently it even has some similarities to Paranormal Activity. Say what? 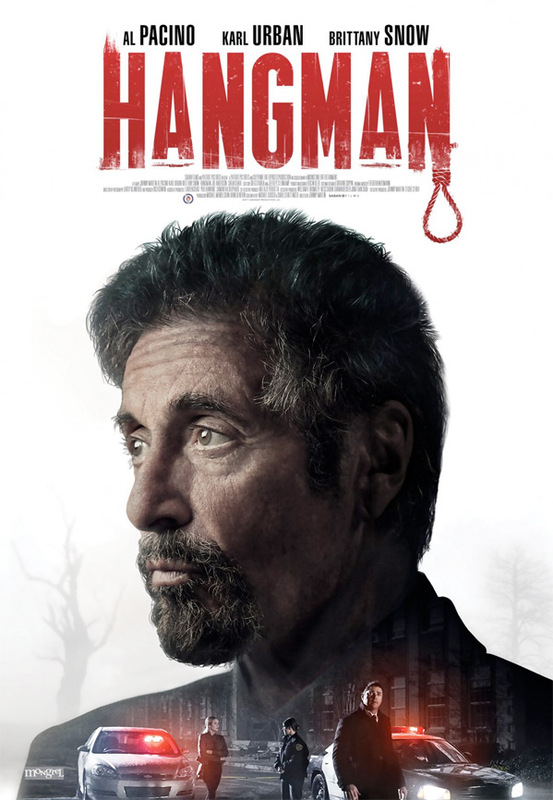 From director Johnny Martin (of this year's Vengeance: A Love Story) the crime thriller stars Al Pacino as a homicide detective who teams up with a criminal profiler to catch a serial killer whose crimes are inspired by the children's game Hangman. Also starring Karl Urban, Brittany Snow, Sarah Shahi, and Joe Anderson. From the footage in this trailer, this seems closer to "Mindhunter" or "True Detective" or even The Snowman than most crime dramas, but maybe there's a big twist in it. Might be worth a look. Decorated homicide detective Ray Archer (Al Pacino) and his partner, criminal profiler Will Ruiney, (Karl Urban) are tasked to catch one of the city's notoriously vicious serial killers who is playing a twisted version of murder using the child's game - Hangman, while crime journalist Christi Davies (Brittany Snow) reports on the crime spree, shadowing the detectives. Hangman is directed by American filmmaker Johnny Martin, a former stuntman and second unit director, who has also directed the films Delirium, Case#13, Skeleton Man, and this year's Vengeance: A Love Story previously. The screenplay is written by Michael Caissie & Charles Huttinger. No official release date has been set for this film yet, but we expect it to arrive sometime over the next few months. Stay tuned for updates. Who's interested already? Thoughts?